For treating cosmetic flaws in the teeth of our patients, our team often suggests treatment with porcelain veneers. 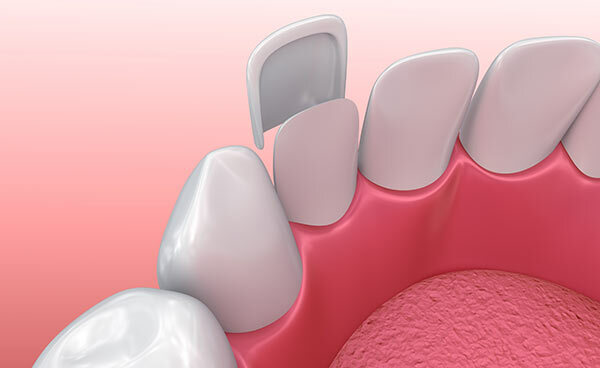 Veneers are thin shells that are bonded to the surface of the patient’s affected teeth. This treatment is a great alternative to the porcelain crown, as it requires less alteration to the original teeth yet still achieves beautifully straight and white teeth. With porcelain veneers in place, patients can enjoy a dazzling new smile! What Is The Typical Use For Dental Veneers? Veneers are custom crafted for your smile and will match your unaffected teeth perfectly. If you recognize one of the above as the reason for your dissatisfaction with the state of your smile, then veneers may be the best treatment for you. First, you will attend a consultation with Dr. Hughes, Dr. Mojdami or Dr. Cakmakci at one of our two Toronto area offices. During this consultation, your doctor will examine your teeth, take note of the flaws you are looking to repair and create a custom treatment plan. Next, the affected teeth will need to be prepared for veneers. This may require the removal of some enamel, which will be done with a gentle scraping. This step is necessary as it allows veneers to properly fit your natural teeth. Finally, the custom-made veneers are applied to your teeth. Using a special cement, a veneer is attached to the tooth. Once in place, your doctor will check to ensure that the veneer is properly placed and matches your remaining teeth. You are then sent on your way, free to show off your beautiful new smile. If you are looking to restore cosmetic flaws in your smile, rest assured that by using this treatment, Dr. Hughes can restore beauty and function to your smile. Learn more today by scheduling a no-obligation consultation with Dr. Hughes.